Trumpet player Guy Few, who suffers from a genetic condition in his brain, shares what he's learned from losing his musical gift twice. In Guy Few's left hand is his trumpet. In front of the Juno-nominated artist sit more than a dozen brass musicians from Harbour View High School's student band program, waiting for him to play. 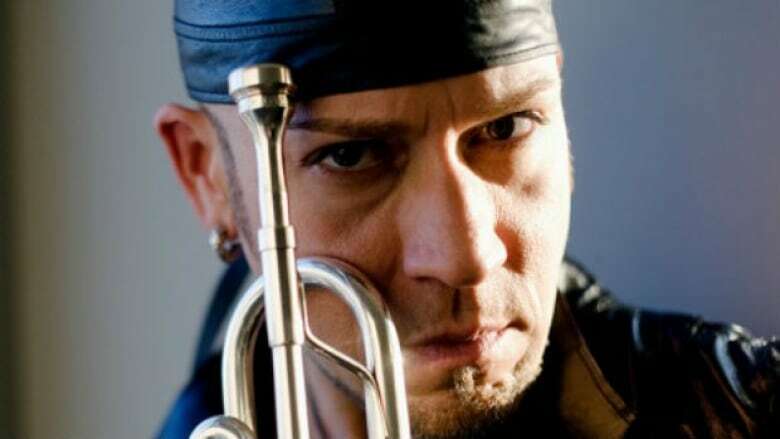 Few is certainly an accomplished musician, even played principal trumpet in a Grammy-winning recording, but he's not here just to talk to these Saint John students about breathing techniques. He has a story to tell. "I had to rebuild my existence and I did that by making, at first, a choice," he tells the group. "A choice I didn't make consciously." Twice in his life, the child prodigy lost his gift. His is the story of a world-class trumpeter who once played in front of crowds but lost his ability to express himself at all. And how he relearned it all again. "We all have a choice," he tells the students, who watch in silence. "I know every one of us has choices to make. Every single one of us has challenges." The next day, the 55-year-old sits in Rogue Coffee in Saint John. He drinks cortados, a type of espresso coffee. With his shaved head, earring and fashionably round glasses, he looks very much like the fixture of the Toronto music scene he is. He was in Saint John to be an adjudicator for the New Brunswick Competitive Festival of Music. The Wilfrid Laurier University trumpet teacher begins by explaining what being a child prodigy means — it's a phrase he doesn't use lightly. It began with his first piano lesson, watching his four-year-old neighbour play a song she'd been practising for a month. Few went into the lesson room but didn't look at the piano as the girl played her two-handed piece. "When she finished, I said, 'I have a piece.' … Evidently, I sat down and played the exact same piece." He found similar success with trumpet. It wasn't long before he was boarding planes for concerts around the country. But one day in 1990, while cooking in his kitchen in the Waterloo, Ont., area, the 27-year-old collapsed. He was taken away in an ambulance. At the time, doctors couldn't come up with a diagnosis. "After a couple of days, and many trips to the hospital, they discovered I had some sort of irregularity in the brain," he says. Exploratory surgery soon turned into actual surgery. Two blood clots were removed, but not without consequences. "I lost language," Few says. "I lost fine motor skills. I lost the ability to play both instruments. And I lost the memory of all of my repertoire." Few suffers from cavernomas — also referred to as cavernous hemangioma — a genetic condition causing blood vessels in the brain to grow irregularly on each other, creating tumour-like structures. He could walk, but only slowly. There were conversations after the surgery he can't remember. He lost his ability to speak French and German and a third of his English. He cancelled all his shows, except one. It was with the Vancouver Symphony Orchestra at a ski resort in Whistler and was set for three months after his surgery. "Every day, I tried to do a little bit of exercise," he says. "Every day I tried play basic fine motor processes, whether it was piano, trumpet. Every day, I focused on simple things to build towards my ability to play." He says the process was instinctual. "I didn't think about the timeline. I didn't think about pressure of having to perform as a soloist with a major Canadian symphony orchestra three months later. "By the time I did that performance with the Vancouver symphony … I only knew the pieces I was playing that day." Despite his fight to work his way back to the top, to never miss a beat, Few ran into problems again in 1998. One large clot this time. Once again, it was removed. Once again, he lost motor function. But the man who had grasped everything so easily had learned something the hard way. "This time I knew how to put [myself] back together because I'd already done it." It took him a month and a half to return to recitals. When Few speaks to young musicians, he tries to instil simple lessons. He wants his students to find the joy in their lives. To find what makes them happy. He sees interconnectedness between the activities we do and how we feel. "My hope in working with students of any age is to help them recognize the success they have in their own lives," he says. "To find solutions, not only through me, but through themselves for the things that are challenges." During Few's talk at Harbour View, Grade 10 student Lauren Kelly has an emotional response. He leaves an impact on people who hear his story. "Our challenges give us the opportunity to decide how to face them," he tells the students. "As I often say, we can sit on the sofa … Or we can choose to face our challenges and to find solutions." During an interview later, Kelly, a novice trumpet player, cries again. "Just the fact that I get to work with him, is like, 'Whoa,'" the 16-year-old says. "It's something I'll keep around with me the rest of my musical career." Few now has six more clots in his brain. His doctor told him playing trumpet may be partly to blame for aggravating his condition. "Being tired, flying a lot and playing the trumpet," Few says, laughing. "These are problems." The musician monitors what's happening with his health, and that seems sufficient. Few recognizes that what makes him happy, the career he based his life around, may be set on ruining his life. But music also saved him, he says, and getting back to it was essential. "Earlier, when talking about myself, I said music was, in a way, a way of expressing my thoughts," he says. "It makes me realize, that although I can talk about a lot of things and relate to a lot of things, it really comes down to what I am able to express through music."